When we organized the 1994 FSM reunion, Lee Felsenstein took on the task of producing its video documentation; and circulated a modest manifesto concerning our status as elders and our responsibility to pass on information and culture to younger generations, in forms that would resonate with their experiences. He proposed the formation of an organization to secure the intellectual property represented by the reunion videos and other FSM materials, and to facilitate its use by documentarists speaking to youth. An ad-hoc committee convened at the reunion to consider the complications of this proposal and met several times in 1995. Its most substantive outcome was to leave Peter Franck convinced that the move was appropriate and necessary. Lee began again to polemicize for this in 1996, and recruited Peter, Michael Rossman, and others who had been active in the previous reunions and in tending the FSM's heritage, to undertake the organization of the Free Speech Movement Archives (FSM-A) as a not-for-profit corporation. 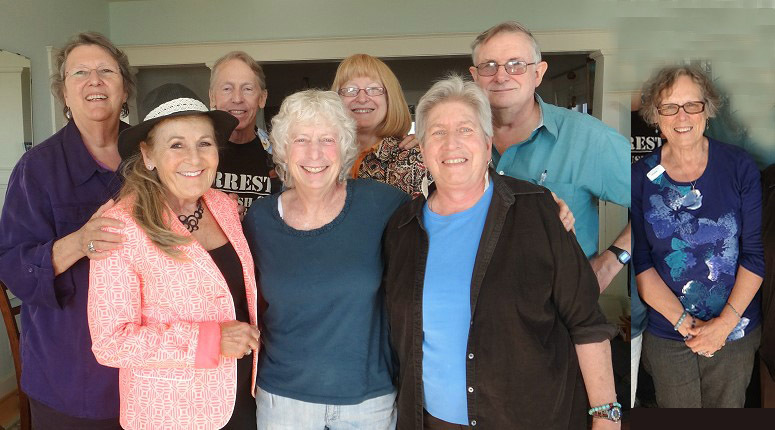 After Mario's death in November, Marilyn Noble gave the project crucial focus and impetus by scheduling our meetings at her Oakland home and providing for them lavishly. An appropriate Board of Directors was invited, and most gathered at our first formal meeting on January 25, 1997. Lee recruited Kathleen Piper to shepherd us through the mechanics of incorporation, and we set to work seriously. It took longer than we expected, but we have brought the organization to legal birth -- and in the process have engaged the first projects of FSM-A, and begun to gather people with the skills to carry them through. The incorporation papers were filed in March 1998. The documents qualifying FSM-A for tax-exempt 501(c)(3) status will be filed later this year. We expect their approval, for our motives are as holy as cherry pie -- to testify for free speech by passing our history on to our children and beyond, along with the live charge and complexity of understanding it, as best we can. Separately, you will find FSM-A's formal statement of purposes, and a roster of its board of directors and officers. As all were deeply involved with the FSM, we trust that you know enough about enough of them to be assured that this effort is carried on by responsible hands and in a continuity of spirit. Although it was unfeasible to constitute FSM-A as a formal membership organization, we are well aware that we have a core constituency, and we hope to represent you well. (Indeed, we mean to help you represent yourselves, in filling out our history and connecting it to life.) As the tasks of bringing this formal vehicle to life are done, we hope to involve more of you in exploring what can be furthered through it as the FSM-A Web. We invite you to begin this exploration immediately, as the FSM-A Web site develops. You will notice that although FSM-A's purposes focus on the original document of the FSM, they are drawn broadly, to legitimate its relation to a broad range of movements and developments, extending from before 1964 to the present. They are drawn broadly in another sense as well. While organizing FSM-A, we came to see that it was natural to integrate the other long-term activities of the diffuse association of FSM veterans into its operation. One might take this simply to mean that the maintenance of our mailing-list, the long-promised newsletter, and the organizing of future reunions will proceed henceforth under our own non-profit umbrella. But we see the relation as more organic. Much of the FSM's history and interpretation has been recorded, in a complex welter of documents -- but even more has not, and remains live in the memories and present lives of those who made this movement and moved on. As much as paper or more, you are the document of the FSM. We are the document together still, together with the echoes in Tianamen Square, and the signal victory that FSM-A's legal director Peter Franck won in court in defense of the First Amendment freedom of micro-radio broadcasting, before SWAT teams kicked down the doors of three microstations in Florida to send a counter-signal. In this circumstance, our mailing-list is an essential index to a vital, collective document still developing, which our mailings and reunions, our symposia and memorials extend. We intend FSM-A to gather and tend this larger document as an organic extension of the document of 1964; and expect that it will prove a vehicle to elicit histories from many whose views and stories have never been recorded. The Web site may facilitiate this; we invite you to help us explore. After helping organize a symposium on Mario at the Organization of American Historians conference in spring 1997, Robby Cohen has taken on direction of FSM-A's academic affairs, concerned with focussing critical attention on the FSM as history. Teachers and scholars concerned with this should contact him; we hope you'll spread this invitation. [See Robby's sidebar.] Another long-term project involves the maintenance of our crucial mailing-lists, under the stewardship of Barbara Stack. Please help her to keep them current, and growing. No planning has yet begun for the next FSM reunion. We invite you to consider other projects that FSM-A might properly shelter and assist. We hope that the news of what we've done so far will gladden you, and that you will find ways to help us carry on the work of FSM-A and make it useful in the world. SECTION 1. OBJECTIVES AND PURPOSES The primary objectives and purposes of this corporation shall be: to facilitate and undertake the gathering, preservation, study, interpretation, and dissemination of information and materials related to the Berkeley Free Speech Movement of 1964 -- to its roots and antecedents, its events, and its subsequent consequences, influences, and interpretations. This corporation's activities shall include locating, collecting, cataloging, developing and producing relevant information and materials; changing their formats and adapting them to new formats; making them available for educational, charitable, and scholarly purposes; licensing and entering into agreements for their educational uses; commissioning and assisting in their scholarly interpretation; and organizing public educational events and other means of facilitating communication among their users, potential users, and other persons concerned with the historical development of civil liberties and movements for social change. The corporation shall engage in appropriate promotional and fund-raising activities to support its purposes. c/o FSM Archives, 1801 5th Street Berkeley CA 94710-1914. Please note the subject on the outside of the envelope.